Pine Hills Retirement Community was designed by people who knew exactly what retirees were looking for. Founded in 2006, Pine Hills Retirement Community was founded by local owners Dorothy and Harold Wyatt and their son Steve Wyatt. They knew from the community’s inception what amenities would be attractive to their friends and neighbors — they just asked themselves what things they themselves would want to experience in retirement living and chose the location, created the common areas, and designed the apartment floor plans accordingly. Our mission is to provide quality assisted and independent living services for seniors in the Black Hills area, while promoting wellness, independence, safety and dignity. We are very proud of our dedicated professional staff at Pine Hills Retirement. Click here to get to know them. The residents at Pine Hills are like family. 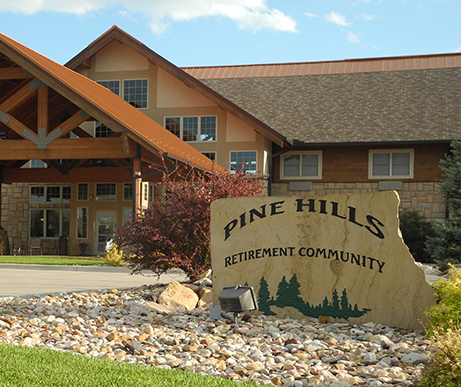 Hear what they have to say about living at Pine Hills Retirement. Click here to meet the owners of Pine Hills Retirement Community.